Get all the great performance characteristics of the Micro-Machined Silicon Transducers in these wet/ wet differential pressure models. 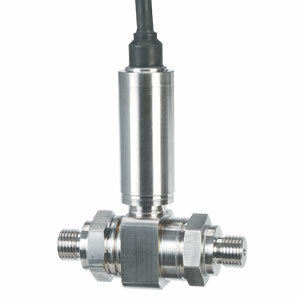 These rugged stainless steel transducers are ideal for tough industrial automotive, or aerospace applications requiring a wet/ wet transducer. They can be used in test benches, filter monitoring, hydraulic, flow, or water/wastewater applications, as well as factory or pneumatic air, pitot tubes, air speed and other industrial or aerospace applications. The solid state silicon core and all stainless steel wetted parts will provide long, reliable service life with excellent long term stability. To obtain their high accuracy and stability, the PXM409 Series use state of the art digital mapping of the temperature, pressure and output performance of the silicon sensor in conjunction with a custom ASIC to provide dynamic thermal compensation across the temperature and pressure parameters. 注: * To order conduit fitting backend change model number from “PXM409” to “PXM409C”, no additional cost. Comes complete with 5-point NIST traceable calibration certificate.